Every year for the past 26 years we have said to ourselves, we should have special pages for interesting holidays. And every year for the past 26 years we have said, having failed once again to put up a page, "Oh well, we'll do it next year." Welcome to next year. We had planned to do a page for Chanukah, but with our current show featuring 160 Chagall etchings and lithographs and with many pages on our website devoted to Chagall's works, including pages devoted to Chagall's etchings for the Bible, his Bible lithographs from the 1956 and 1960 Verves devoted to this subject, and his lithographs of The Story of the Exodus as well as his Jerusalem Windows lithographs all aavailable on our web site, we thought that might do. Click here for examples). We were all set to do a page for Christmas, when we read a feature on Christmas in The Boston Globe reminding readers in the Commonwealth (and elsewhere as well I suppose, but when one lives 30 miles from "The Hub [of the Universe]," it is occasionally hard to remember that there is an elsewhere), that in the Massachusetts Bay Colony it was illegal to celebrate Christmas and that as late as the 1840s, December 25th was not a legal holiday: schools and offices were open for normal business and truants were punished. This reminded us that in Shakespeare and Spenser's England, Christmas was not the day on which the hoarded "handsels" or gifts (as J. R. R. Tolkien's translation of the late 14th-century poem, Sir Gawain and the Green Knight, puts it), were distributed, but the first day in a series of days (as commemorated in the popular carol about partridges in pear trees, gold rings, lords a leaping, and other useful gifts) to celebrate the end of the old era and the beginning of the new one. Hence Shakespeare's play Twelfth Night, or What You Will, ends, as do the twelve days of Christmas, with an epiphany or revelation that shows us "A natural perspective, that is and is not," just as the Three Magi arrived in a stable and saw a new-born king when they looked at the child of impoverished parents sleeping in a stable. We herewith present, for your consideration, our own Christmas / Twelfth Night mixture of old master prints and drawings and more recent works whose common theme is that we like them quite a lot. 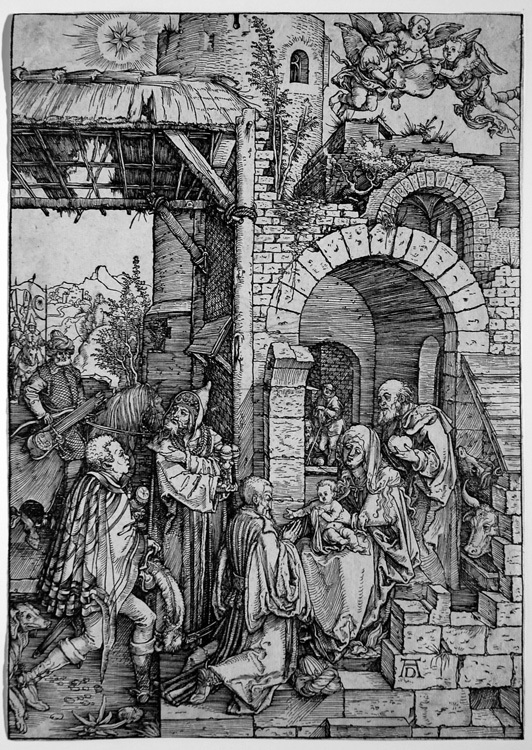 Albrecht Dürer (Nuremburg, 1471-1528), The Adoration of the Magi (Bartsch 87, Strauss 76, Meder M. 199). Original woodcut, c. 1503. Executed for The Life of the Virgin, this impression appears to be an example of Meder's state a "Before the text": "precise lines, bright because almost totally devoid of cross-hatchings." Following these early proofs, gaps in the border develop, there is a split below the leafy plant lower left (state b, proof before the 1511 Latin edition); after the 1511 edition witht the Latin text verso: 2 gaps above the star and one above the angels; 2 gaps on the right, and one on the bottom, etc. Our impression precedes all of these markers of later printings. A lovely impression with only a few skined spots verso and one small pinhole upper left. This print is illustrated in almost every book on Durer's work as a printmaker. Image size: 296x209mm. Price: $20,000. 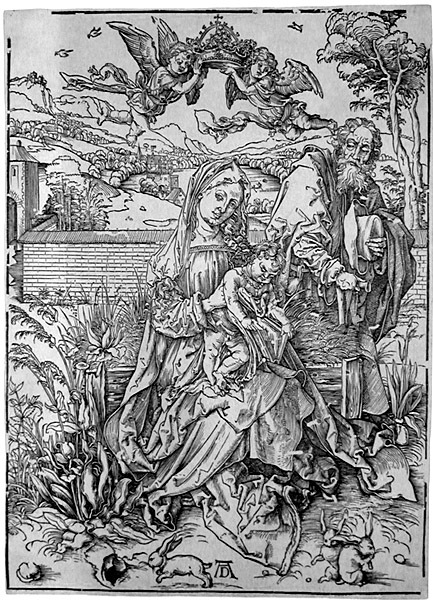 Albrecht Dürer (Nuremburg, 1471-1528), Holy Family with the three hares (Bartsch 106, Strauss 36, Meder 312h/i). Original woodcut, c. 1496. One of Dürer's earliest major prints, this work was one of the first to reveal his genius. The three rabbits add a playful touch to this scene of domesticity. C. 1580 impression of a work that has been praised by Wolfflin as "radiant" in its revelation of "the abundance of life." A clear impression that is stil printing quite well. Image size: 392x280mm. Price: $6000. 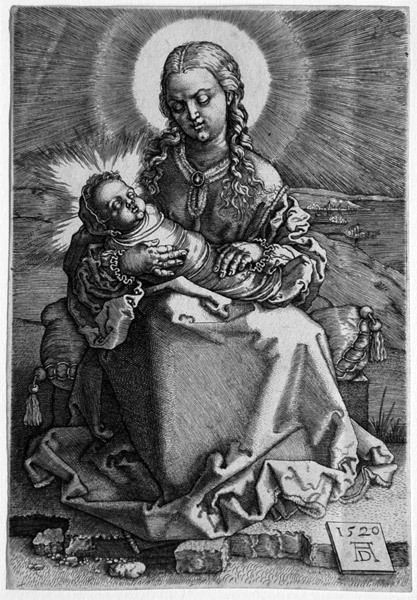 Albrecht Dürer (Nuremburg, 1471-1528), AFTER, Madonna with the Swaddled Infant (Bartsch 38, Strauss 94, Meder 40). A brilliant reverse copy of Durer's 1520 engraving executed by Jan Wierix (Antwerp, 1549-1618) c. 1563 (Maquoy-Hendrixx 1705). Heller notes the existence of twelve other copies. A beautiful impression on laid paper of one of Wierix' most successful recreations of a Durer masterpiece. The Wierix brothers were the most technically proficient engravers in Antwerp in the later 16th century. They chose to make engravings after Durer's masterpieces to prove their technicl skills. Image size: 143x100mm. Price: $2500. 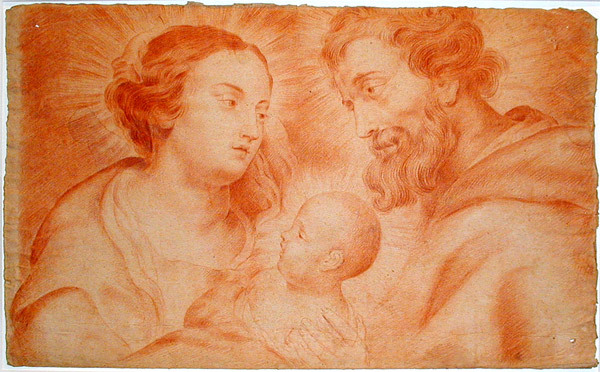 Flemish School, 17th Century, The Holy Family. Red chalk on laid paper with the fleur-de-lys above coat of arms watermark, early-mid 17th century. This large, beautifully-drawn work reflects Rubens' influence over Flemish painting and drawing during the 17th century and is similar in style and subject matter to several of the Louvre's Rubenses and closer to them than to any other of the Flemish Masters on display in November 2007. Image size: 308x500mm. Price: $7500. 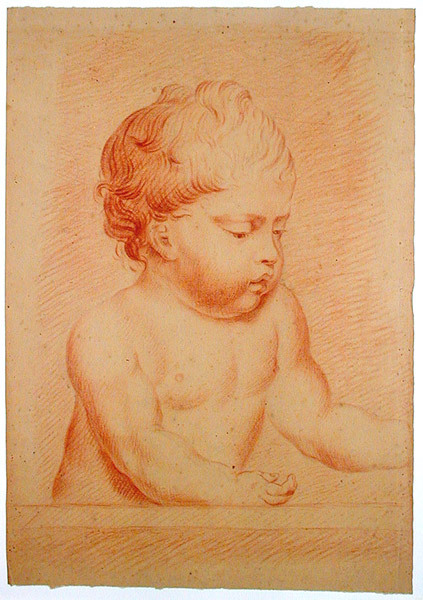 Jean-François de Neufforge, Comblain-au-Point, 1714-1791 Paris), Infant Christ child III. 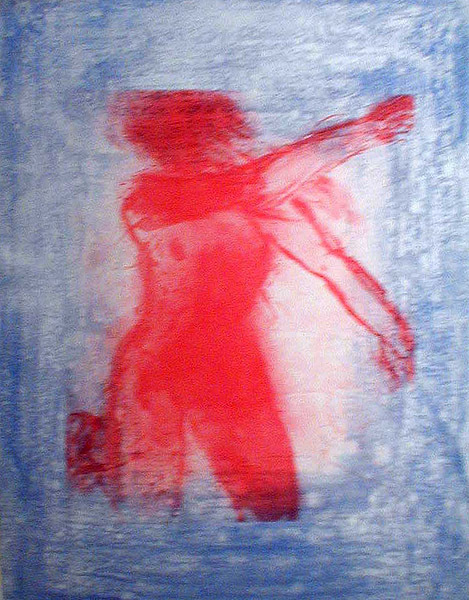 Red chalk on tan laid paper. Watermark: none. Image size: 455x332mm. Price: $2750. Mary Cassatt (American, 1844-1926), Denise holding her child (B. 204 ii/ii). Original drypoint, c. 1905. Printed for the artist in 1923 by Delatre. One of the artist's most tender depictions of the bond between child and adult. A very fine impression on tannish-gray laid paper with an unreadable watermark: all lines print very clearly and there is strong contrast between the lines across the child's chest and Denise's hair and the background. Like all of Cassatt's drypoints, good impressions (such as this) are scarce. Three rust marks outside the platemark not affecting the image and invisible when matted. Image size: 209x146mm. Price: $6800. 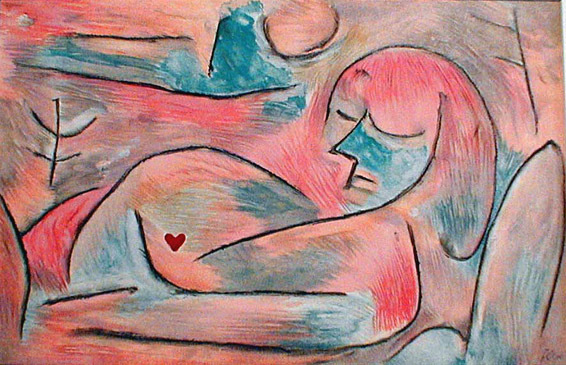 Paul Klee (Swiss, 1879-1940), Sommeil d'hiver / Winter's Dream. Original lithograph, 1938. Edition: as published in the deluxe art review Verve in 1938. Signed in the stone. Winter, though blue with cold is also pink and red with life and seems to be pregnant with spring. A wonderful piece, full of our yearning for spring and summer, rebirth, growth, and the fullness of life, in the midst of winter's delathly cold and barrenness, like the dead tree in the upper left side. On the reverse there is a black & white lithograph by Joan Miro which incorporates Klee's name and the title of the work. Image size: 349x250mm. Price: $1250. 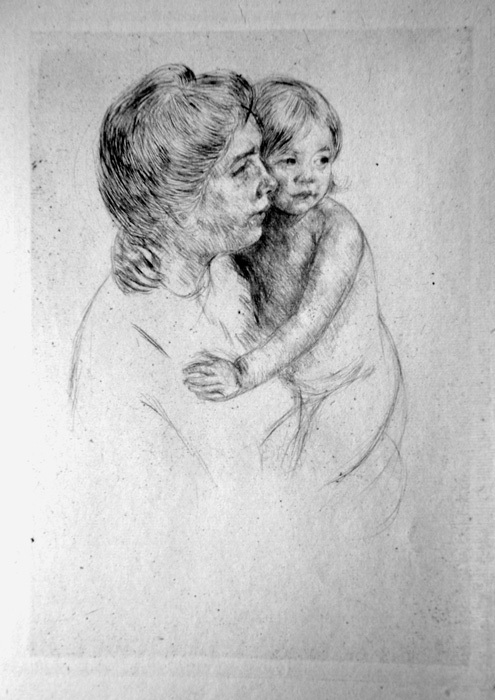 Käthe Kollwitz (German, 1867-1945), Mutter mit kind auf dem arm / Mother with her child in her arms (Kl. 110 iv, Knesebeck 114 V/VII d). Original etching, 1910. Edition: an unsigned impression from the edition printed by Otto Felsing. "With engraved script along the lower edge of the plate. At left: "Orig. Rad. von Käte Kollwitz". At center: "VERLAG VON EMIL RICHTER, DRESDEN". At right: "Druck v. O. Felsing, Berlin-Chlttbg." Richter edition, 1921. Proofs in brown, on copperplate paper. On illuminated areas, such as the child’s cheek, there is no plate tone. Not signed, but occasionally with accommodatory signatures." This joyful etching is one of the few that Kollwitz executed that shows people enjoying life's innocent pleasures. This is one of Kollwitz's most sought-after etchings. Image size: 193x131mm. Price: $2750. Marc Chagall (Russian, 1887-1985), Le Ballet: Daphnis et Chloe (M. 581). Original color lithograph, 1969. 10,000 unsigned impressions for Marc Chagall : Le Ballet. 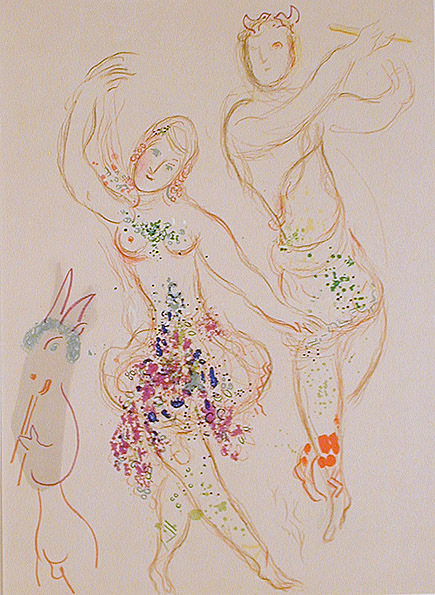 One of Chagall's more joyful explorations of the theme of Daphnis and Chloe, the innocent young lovers whose adventures Chagall repeatedly rehearses. In another of his works on this topic, the goatish musician is replaced by Cupid with his bow flying over the lovers. Image size: 325x258mm. Price: $1,275. Pablo Picasso (Spanish, 1881-1973), Le picador II (Mourlot 350, Gauss 788, Bloch 1017).. 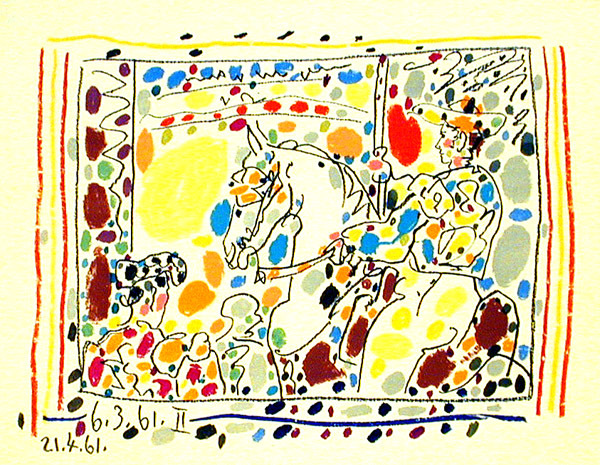 Original 23-color lithograph, 1961. 50 signed & numbered impressions plus an unsigned edition ublished in Jaime Sabartes' A los toros avec Picasso (Monte Carlo: Editions Andre Sauret, 1961). Edition size unknown. Picasso was a lifelong fan of bullfights. Our impression dated in the stone. Our photograph of this print was reproduced in Directions in Art: Printmaking by Louisa Sherman and Dianne Hofmeyr (London: Heinemann Library, 2003), p. 5. Image size: 200x260mm. Price: $3000. Bathrobes seem to be a very popular gift for Christmas or Chanukah. Here we have a particularly beautiful one, suitable for holiday giving by wives to husbands (and vice versa): Jim Dine (American, b. 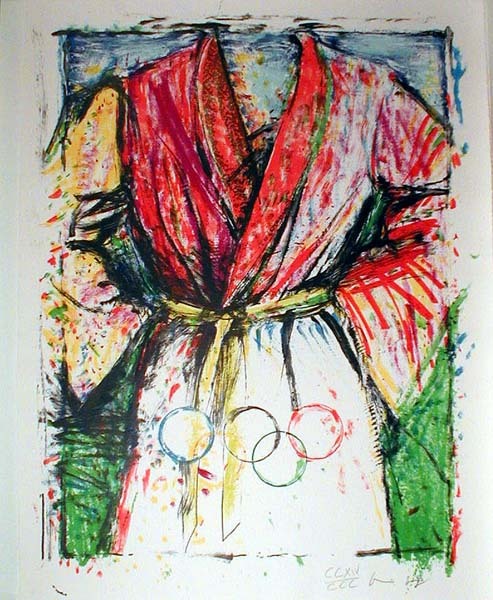 1935), Olympic Bathrobe. 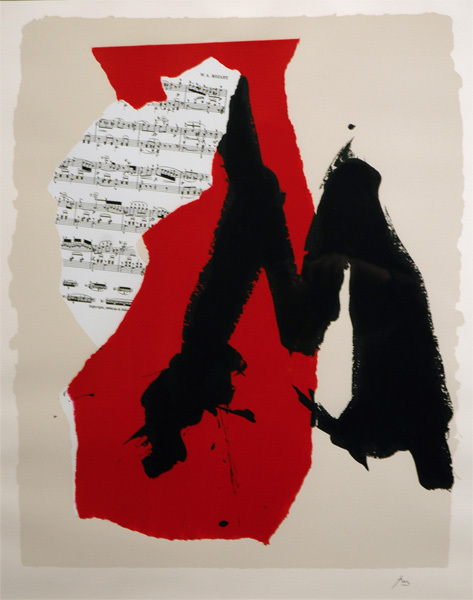 Original color lithograph, 1988. 300 signed & numbered impressions plus 30 artists proofs. Executed for the 1988 Seoul Olympics but not released for the Olympics, this piece sold at auction 3 times between 1990 and 1993, averaging nearly $7000. In Dine's personal iconography, this is a self-portrait. There was also a Roman-numeral edition of 300 which was supposed to be for the members of the International Olympic Committee. The edition was not issued in 1988 because the publisher went bankrupt. We have been told by one of his creditors that while the prints were in storage under the supervision of the Bankruptcy Court, many impressions were water damaged, but we have not actually seen any of these damaged pieces. Image size: 890x685mm. Price: $6500; SPECIAL HOLIDAY SALE PRICE: $5000 (until January 10, 2009). I have been told by my wife and daughters that jewelry is always acceptable as a holiday gift. My wife in particular likes this one: René Magritte (Belgian, 1896-1967), Les bijoux indiscrets / The talkative jewels. Original color lithograph, 1963. 75 signed and numbered impressions, 20 HC impressions, and an edition of c. 2000 impressions published in the deluxe art review, XXe Siecle in 1963. 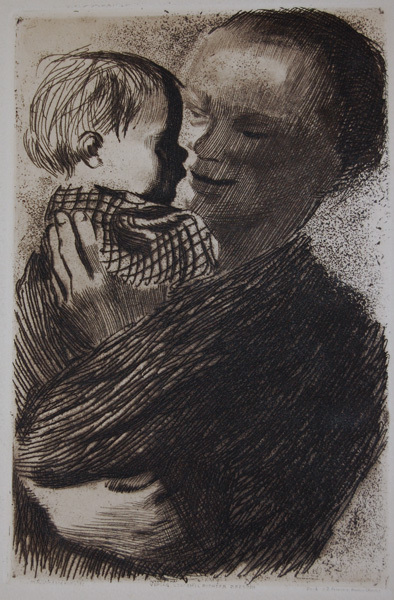 This is his first lithograph, one of twenty lithographs and etchings he finished before his unexpected death in 1966. The work is illustrated in Gilbert Kaplan, ed. Surrealist Prints (NY: Abrams, 1997) and reproduced on the front cover of the catalogue raisonné of Magritte's prints, The Graphic Work of René Magritte, 1982. A very important print. Image size: 244x310mm. Price: $1850. Joan Miró (Spain 1893-1983), La danse de feu / The Fire's Dance (Maeght 341). Original color lithograph, 1963. 90 signed & numbered impressions of which this is one plus c. 1500 unsigned impressions with centerfolds published in the deluxe art review, Derrière le Miroir, in a celebration of Miro's collaborations with the ceramicist Jospe Llorens Artigas. The title probably refers to the action of the fire on the clay in Artigas' Japanese wood-fired kiln where they worked. 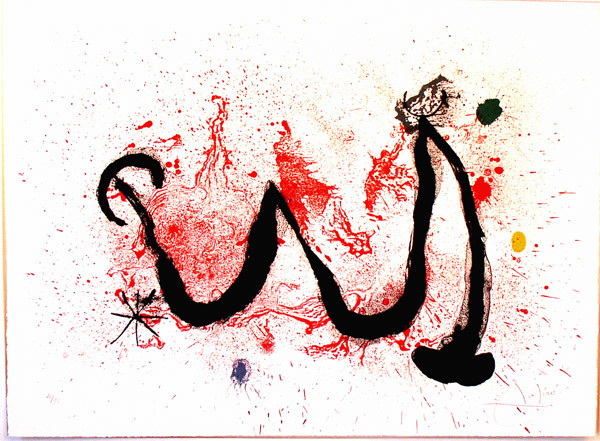 There is a full-page illustration of this piece in Indelible Miro. Image size: 475x655mm. Price: $17,500. Also available in the unsigned edition published in Derrière le Miroir with the centerfold and without margins. Image size: 380x560mm. Price: $1400. SPECIAL HOLIDAY SALE PRICE: $3500 (until January 10, 2009). 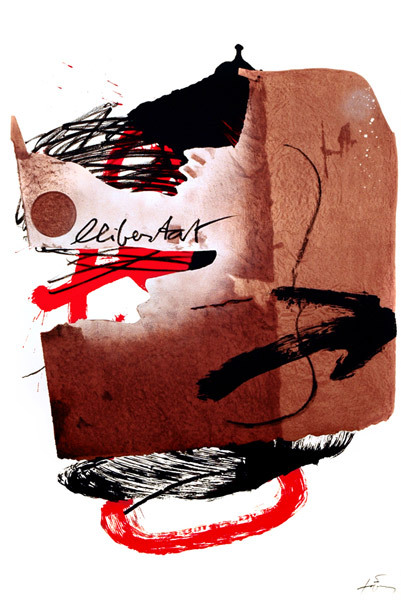 Antoni Tapies (Spain, b. 1923), Llibertat / Liberty. 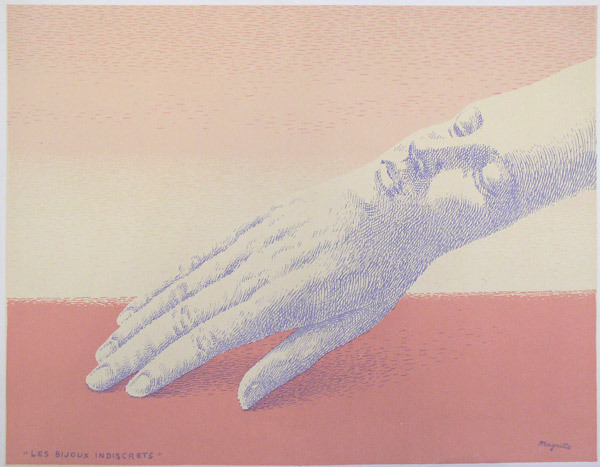 Original color lithograph, 1988. Edition: 300 signed and numbered impressions plus 30 artists proofs printed by Galerie Lelong, Paris, for the 1988 Olympic Print Portfolio. The work was never published because the Olympic Portfolio publisher went bankrupt. We have been told by one of the principal creditors that while the prints were in storage awaiting the outcome of the bankruptcy proceedings, many of the prints were ruined by water damage. All of our impressions, however, are in excellent condition. Image size: 892x590mm. Price: $4650. We also have one of the 20 signed impressions available for purchase (see image left). Price: SOLD. Claude Garache (French, b. 1929), Bleue V. Original color aquatint and etching, 1994. Printed by Maurice Felt in Paris and published by Spaightwood Galleries. 25 signed and numbered impressions plus 3 e.a. and 6 H.C. impressions. For additional works by Garache and information about the artist, please click here. Image size: 820x610mm. Price: $1500; holiday special: $1200 (Until January 10, 2009). Pierre Alechinsky (Belgium, 1928), Central Park. Original color lithograph, 1975. 175 impressions on Arches plus 50 on japon. There are also 25 impressions H.C. Central Park is also the subject of Alechinsky's most important painting, which depicts Central Park as a monster devouring everyone that enters its domain. Image Size: 495x657mm. Price: $2,150. 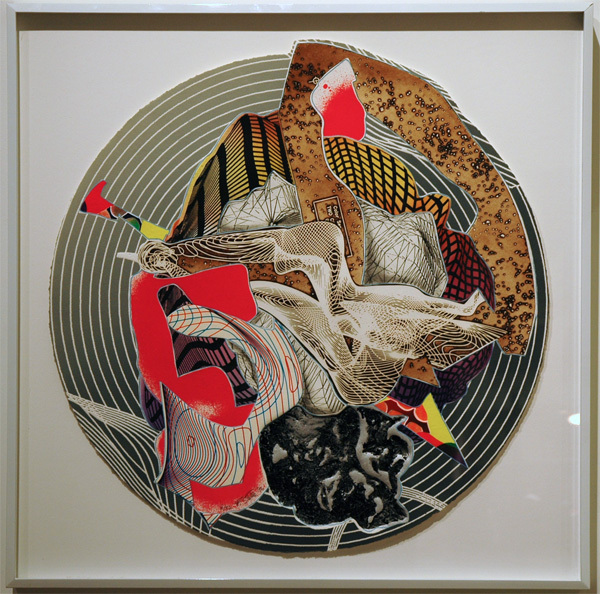 Frank Stella (American, b. 1936), Atvatabar. 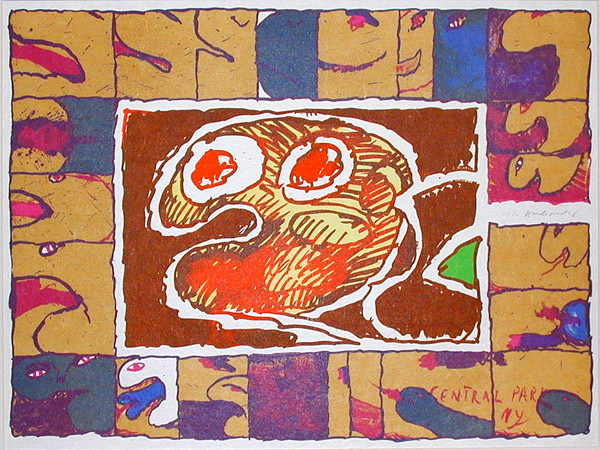 Original lithograph, intaglio, stamping, screenprint, 1996. 32 signed and numbered impressions on TGL handmade paper plus several artist's proofs. This is part of Stella's Imaginary Places II series. Published by Tyler Graphics with their blindstamp. Image size: 665x665mm. Price: $6250. Photographed in the frame through the plexiglasthe image is actually much more vibrant than the photograph suggests. Joan Gardy Artigas (Spanish, b. 1938), La femme bleue / The blue woman. 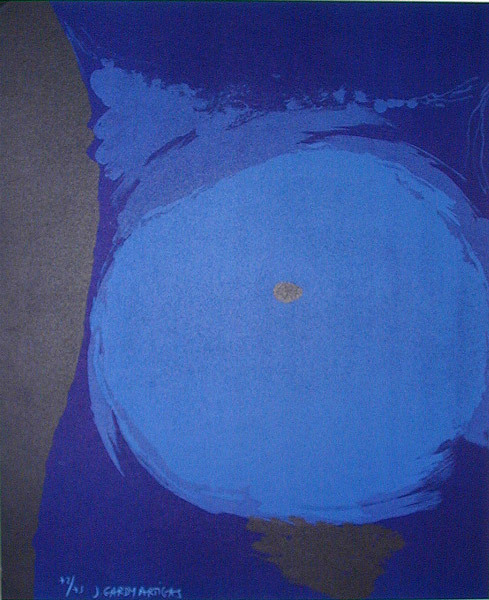 Original color lithograph, 1968. 75 signed and numbered impressions on Rives vellum published by Maeght Editeur in Paris. Artigas has explained his love of lithography as follows: "If I want power, impact, a startling image, I use lithography. With the technique of printing directly off the stone, it is possible to get a maximum of ink on the paper. This ... allows ... powerful color." Image size: 490x400mm. Price: $750.